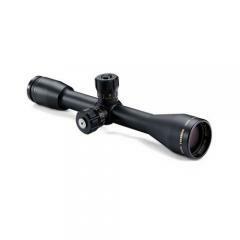 Bushnell ET1040 Elite 10x40 Mil Dot Tactical Riflescope ET1040 FREE SHIPPING! The Bushnell Elite Tactical 10x40 is a powerful fixed-power riflescope built for durability and medium to long-range precision. Its Mil Dot reticle assists with rangefinding and its precise target turret windage and elevation controls make it easier to place your shot perfectly. The premium fully multi-coated optics come with the advanced Ultra Wide Band Coating, which maximizes light transmission across an extended portion of the visual spectrum for enhanced clarity and brightness. An additional Rainguard HD hydrophobic coating on the external surfaces breaks up water droplets to reduce light scattering, ensuring the same premium image resolution even in wet conditions. The scope's rugged one-piece aluminum tube is argon-filled and O-ring sealed to keep out water and prevent fogging. ©2002-2019 CopsPlus.com: Bushnell ET1040 Elite 10x40 Mil Dot Tactical Riflescope ET1040 FREE SHIPPING!